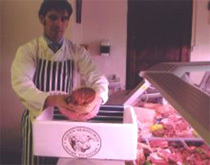 We have the best quality, traditionally reared Pure Hereford Beef for sale, delivered to your door. Our Pure Hereford Beef is matured for 21 days in the traditional manner and packed in clearly labelled bags ready for your immediate consumption or for storage in the freezer. 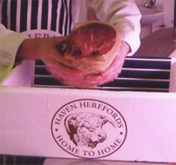 Our Pure Hereford Beef is available in a family size, 20 kilo box or a smaller, 10 kilo box. 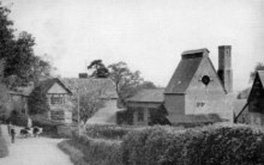 The joint size in a 20 kilo box is approximately 1.8kg (4lb). Beef burgers can be made for you on request. The joint size for a 10 kilo box is approximately 1.3kg (3lb) and beef burgers can be made for you on request. The rib joint and fillet steak may be available in the 10 kilo pack but not always guaranteed. The packs may vary depending on the weight of each animal. Pack price is £11.00 per kilo plus delivery. We charge delivery at cost, priced according to weight or collection can be arranged. Please call us at The Haven on 01544 318 255 / 07974 744660 or contact us for beef availability and a convenient delivery time to suit you.